Rep. Tom O’Halleran (D., Ariz.) said on Monday that Democrats "went a little bit too far" in an effort to oppose Supreme Court Justice Brett Kavanaugh. 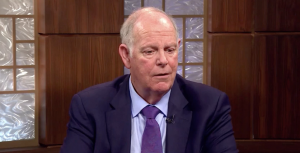 O'Halleran was telling "Arizona Horizon" host Ted Simons how he was disappointed with "both sides" for how they acted during the confirmation process for Kavanaugh. Simmons asked O'Halleran what specifically bothered him. "What especially bothered you? You said ‘both sides’ were at fault here. What especially bothered you from the Democrats?" Simmons asked. "The Democrats I thought went a little bit too far," O'Halleran said. "We’re supposed to ask probing questions. I don’t like it — I never did like it — when people got up there and pontificated time and time again about their position. This is supposed to be about a discussion back and forth between you and the nominee." Senate Democrats attempted to block Kavanaugh's confirmation by using allegations of sexual misconduct lodged against him in recent weeks. The allegations went back to when he was in high school and college. Democrats focused their efforts on the allegations in an attempt to galvanize opposition and put pressure on Republicans such as Sens. Susan Collins (Maine) and Jeff Flake (Ariz.). Both Flake and Collins ended up voting for Kavanaugh; Sen. Lisa Murkowski (R., Alaska) was the only Republican senator who did not. Kavanaugh's first accuser, Christine Blasey Ford, told the Washington Post that Kavanaugh, then a junior in high school, attacked her when they were at a party in Maryland in the early 1980s. A second allegation came from a woman named Deborah Ramirez who accused Kavanaugh of exposing himself at a dorm party during his freshman year at Yale. Another allegation was brought forth from a woman named Julie Swetnick, who is represented by anti-Trump lawyer Michael Avenatti. Swetnick claimed Kavanaugh was involved in a series of "gang rapes" when he was in high school, but she offered no additional evidence or witnesses to support her allegations. Kavanaugh vehemently denied all accusations and no witnesses or other evidence corroborated the alleged assaults. Senate Democrats called the allegations credible with several stating Kavanaugh doesn't get the presumption of innocence. As the allegations remained uncorroborated and holes developed in accusations, Democrats and those opposed to his confirmation shifted focus to questions over Kavanaugh's judicial temperament and history of drinking beer. In the final days before his confirmation, Senate Majority Leader Mitch McConnel (R., Ky.) spoke out about how Democrats opposition to Kavanaugh began as soon as his name was announced and was part of the the party's "same old playbook." President Donal Trump said in the wake of Kavanaugh's confirmation that Democrats behavior during the confirmation process "was one of the most disgraceful performances I've ever seen."